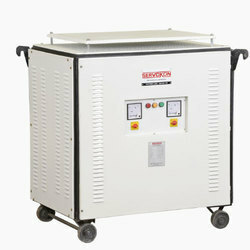 Exporter of a wide range of products which include step up transformers. As automatic voltage stabilizers are loaded with the plethora of features, they are highly demanded in residential applications for protecting Refrigerator, Deep freezer, Bottle and water coolers, BOD incubators, Air conditioning appliances from voltage fluctuation. We are a quality concerned company that doesn’t compromise with the quality of the manufacturing process and even the final dispatch is done under the supervision of technical experts. Looking for “Step Up Transformers”?